making awful sounds when she breathes. 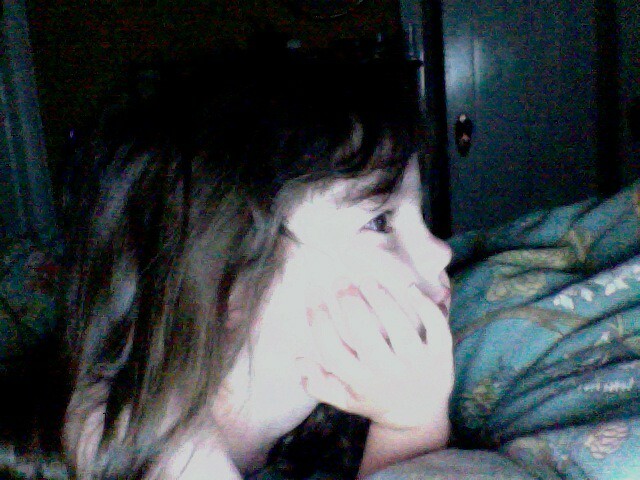 She calms, for a few moments, then sits up, a sobbing mess. I scratch her back. Revisit her favorite lullaby. 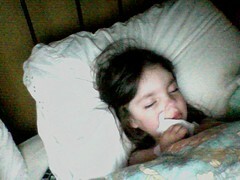 Listen to her snore softly, during the few minutes she’s asleep, before the next coughing fit starts. Wonder what it would be like to have all three kids like this, in the middle of the night, at once. Knock on wood (literally) after thinking such thoughts. Wonder where Andy is going to sleep tonight. Wonder how parents do this with children who are sick often or sick always. Wonder what tomorrow will bring. Wonder what the next hour will bring. Wonder if I will get sick. Wonder why we, as a species, get sick period. Wonder who wrote “The Nightly Clean-up Song,” which is on Sprout right now. Wonder why I’m watching Sprout and not something else given that Sophie is, thankfully, sleeping, clutching her tissue as she would a doll. If the last hour has taught me anything, though, she’ll be up again soon. With a raspy cough. Or tear-soaked cheeks. Or the basic discomfort that comes with every common cold and the realization, now that she’s older, that there’s little to be done. It happens to everyone. That it’s not fun. I try to remember everything my mom did, and my dad did, when I was little and sick. There was Sprite. And Saltines. Rare one-on-one time with the parent who stayed home from work. Board games. A thermometer that beeped. Medicine in a plastic alligator spoon. All-day PJs. All-day TV. A fitted sheet on the couch. A brass bell. Back scratches. Lots of back scratches. I won’t tell her it changes. That childhood sickness, while much dramatized (she’s 4), is way better than adult sickness—if only because you’re the child, not the adult. I imagine I’m not alone when I admit to wishing I was 7, when it’s the middle of the night and I’m in the throes of a terrible—yet minor—cold. Because no matter how helpful a spouse is during sickness, it’s not the same as a parent. It’s just not. I may no longer receive, in the same way I did as a child, but I can give, in the same way I was given as a child. I didn’t know it would be like this, before children—the up all night listening to the soft, little moans that make my chest hurt. My dad often said, whenever I was sick, that he wished he could take it for me. At the time, I thought he was crazy. This entry was written by kara, posted on April 19, 2012 at 11:45 pm, filed under All and tagged parenthood, sickness, sleep, Sophie, worry. Bookmark the permalink. Follow any comments here with the RSS feed for this post. Post a comment or leave a trackback: Trackback URL.